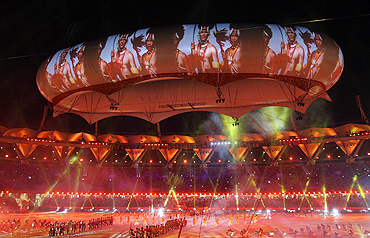 Abhishek Mande meets the man behind the opening and closing ceremony's centerpiece. Mark Fisher may not have featured in the list of people applauded for the opening and closing ceremonies of the Commonwealth Games in New Delhi, but his contribution to the Games loomed large throughout the October 3 and 14 events, literally. The Aerostat, which became the talking point of the gala opening and closing events, was Fisher's idea. The British production designer has conceptualised rock concerts for bands like the Rolling Stones (every show since 1989) and U2 (every concert since 1992). 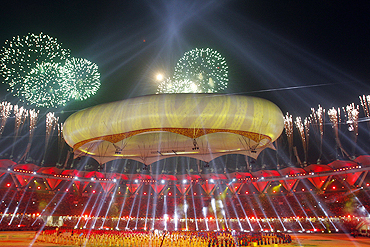 He also designed the opening and closing ceremonies for the 2008 Beijing Olympics. This is the first time I worked on an Indian project. I did a show with Amitabh Bachchan, but that was in Britain. Over the last 10 years or so, most high profile shows are known to have flying effects. This is achieved by using cables across the stadium to lift pieces of scenery or people. The Jawaharlal Nehru Stadium in Delhi is lower and wider than most modern stadiums. Hence, it was difficult to create a sense of focus in that space. That also ruled out the option of using cables. Plus, it was clear from the beginning that there would be a delay in the delivery of the stadium and any major engineering intervention would be difficult or impossible. Since the Aerostat could be brought in at the last minute and would be much less exposed to construction problems, I suggested it. All of it turned out to be true. 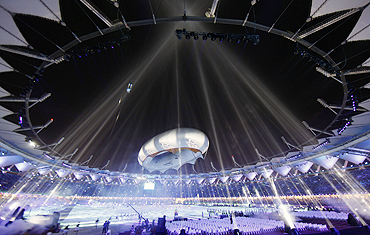 The delivery of the stadium was late, the state of the field of play in the stadium was a complete mess, but it was still possible to get the Aerostat airborne and lift the scenery and use it as a projection screen. My brief was to help ceremony director Bharat Bala put together the show. It was not an arrangement where I would suggest something and he would approve or disapprove. It was more of a dialogue where I would reinforce Bala's ideas or say how something is done or cannot be done. Together we bounced off various ideas. I also suggested the sculpture of the lotus man (for the opening ceremony). My experience here was very different from the ones I have had in the West. There was a layer of bureaucracy imposed over everything. That made it difficult to produce things and a lot of time was taken up waiting for decisions. It was impossible to do some things that were proposed, simply because we ran out of time! The Chinese, on the other hand, understand the need to take decisions quickly and stick to them. 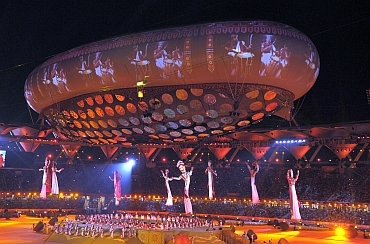 In India, for instance, the idea of flying performers, drummers and dancers under the Aerostat was discussed somewhere around December or January. The procurement process of the Organising Committee was so slow that finally it wasn't possible to recruit the people. This was not because the balloon was unsafe but because there was no time to train the people. In China, we were training people for some aspects of the show almost a year before the event. Having said that, I must confess that it all turned out quite well. We decided to focus on issues like spirituality, music and dance, Indian traditions and yoga (for the opening ceremony). We wanted to concentrate on the qualities that can be summarised as the coming together of the mind, body and soul. Gandhi and his idea of peace being as relevant today as they were 50 years ago was another theme we decided to explore. I would rate this assignment as being somewhere close to the top. I have been quite pleased to be involved with it and pleased with the way it turned out. Everyone associated with the project knows it could have been something else. But what we delivered was what India needed to showcase to the world. People were proud to see it go off so well and everyone associated with it should be proud. Pulling off something like this can be very difficult in India because of the nature of your country and its bureaucracy.